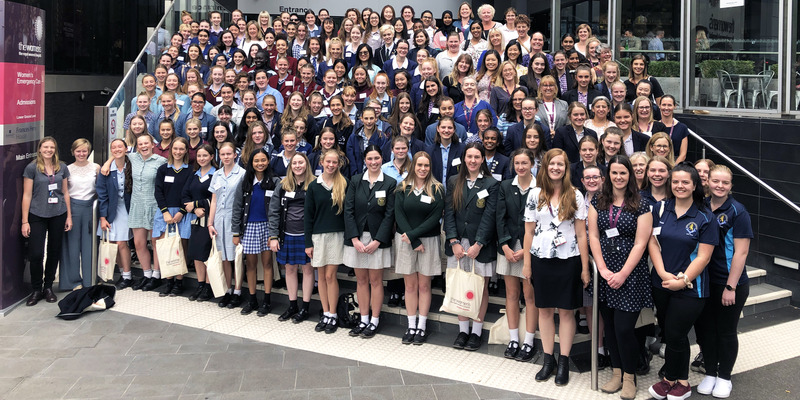 Around 150 school girls and their teachers from 37 schools across Victoria descended on the hospital for the International Day of Women and Girls in Science, participating in hands-on workshops and gaining insight from 24 female research staff, scientists and PhD students, to offer the teenagers an understanding of the breadth and depth of science careers ahead of them. Introducing the event, the Women’s CEO Sue Matthews said much progress had been made by women in many occupations over the past few decades, however for careers in STEMM, (Science, Technology, Engineering, Medicine and Mathematics) girls and women remain a minority, especially in research and decision-making roles. “There are many of us who want to see this change, who believe that girls and women in STEMM need to be encouraged, supported and cheered on,” Dr Matthews said. Now in its third year, the ‘Meet a Scientist’ event offered students a glimpse into the vast array of possibilities that exist in the world of science, through the eyes of the Women’s scientists. Over the course of the morning, students participated in research and clinical simulations including mock newborn resuscitation, cervical screening and laboratory testing for the Human Papilloma Virus (HPV), and diagnosis of endometriosis via pathology slides. Scientists enlightened students with stories of their career journeys to their current roles, and spoke about the research they conducted – covering everything from pre-eclampsia and breastfeeding to menopause and mental health. “Today is a chance to gain insights into navigating a career path from those who have been there and who continue to succeed in this male-dominated industry,” Dr Matthews said. In closing the event, Dr Matthews and the scientists encouraged the students to continue to work towards their dream careers, no matter what obstacles or stumbling blocks may land in their way. “It is worth it. You can do it. Stick with it!” Dr Matthews told the eager group.